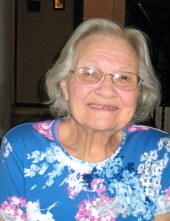 Betty Louise Grow passed away peacefully the evening of April 4, 2019. Betty was born June 29, 1931 in a rural farmhouse in Colorado to Paul and Alice (Allen) Dehn. Her childhood was rich in love and experience through the time she spent with her beloved grandparents. Her family moved to Florida where she graduated high school. In an old photo, 17 year old Betty is smiling, sitting on the back of an alligator. She was a brave girl and would stay brave her entire life. The family returned to Colorado and Betty met Jim Grow, a young handsome soldier from Idaho. They were united in marriage just weeks later on March 11, 1951 and remained married the rest of their lives. In 1957, Jim and Betty bought their house in Dalton Gardens where they would raise their three daughters. Summers were spent swimming, water skiing, fishing, camping and experiencing the beauty of many national parks. Betty taught kindergarten in Dalton for 11 years and was a second mother to many neighborhood children for many more years. Time passed quickly, filled with love, laughter, dancing, the cultivating of color and beauty in the yard and garden. Her garden always produced more than enough. Her grandchildren were loved as she had been loved by her grandparents. Each of them has a grandma story to tell and cherish. Betty was a wife, mother, grandmother, great grandmother and great great grandmother. She loved her family. Her family will love and miss her always. The memory of her will make us smile. Betty was preceded in death by her parents, Paul and Alice; great-granddaughter, Kelli Marie Vandenberg; and brother, Charles Dehn. Betty will be lovingly remembered by her husband and long time love, Jim of Dalton Gardens; daughters, Linda (and Ron) Simmons of Spokane, Washington, Vicki (and Earl) Mills of Post Falls, Idaho, and Lori (and Gary) Grossklaus of Morgan Hill, California; seven grandchildren; 17 great grandchildren; 3 great great grandchildren; and a sister, Mary Sheppard of Jacksonville, Florida. To send flowers or a remembrance gift to the family of Betty Louise Grow, please visit our Tribute Store. "Email Address" would like to share the life celebration of Betty Louise Grow. Click on the "link" to go to share a favorite memory or leave a condolence message for the family.